Apparently it's World Baking Day today, who knew? I haven't got quite as much time as I'd like to bake at the moment, so I was happy to come across this quick and easy recipe for a fruity summer shortcake. Adapted from the BBC Food website. Preheat the oven to 200ºC and line a 20cm tin with baking parchment. Put the softened butter and flour into a food processor and pulse the mixture together. If you haven't got a food processor, you can rub the butter into the flour using your fingertips. Add the sugar and pulse again until the mixture is just coming together. Place half of the mixture into the bottom of the tin and press down firmly using the back of a tablespoon, smoothing and flattening the top. Pour the fresh raspberries evenly over the top of the mixture. Pour the remaining mixture over the fruit and press down firmly with the spoon to flatten. Remove the shortcake from the oven and place a plate or pan on top to compress the dessert. Leave to cool. 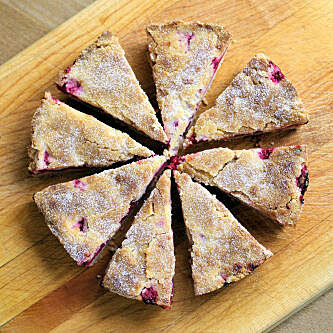 When cool, remove from the tin and cut into slices, dust with caster sugar or icing sugar and serve with cream. 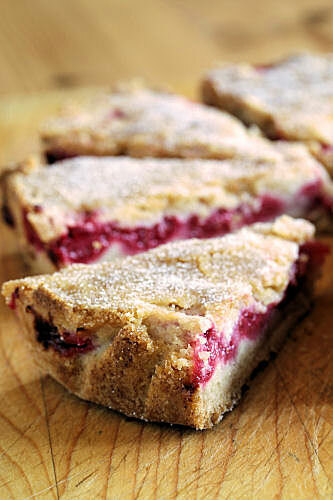 But, I can't imagine a better contribution than this delicious Raspberry Shortcake! This is just gorgeous! This would be great for a Memorial Day brunch coming up! This looks SO delicious! I love how easy it sounds too, thanks so much for sharing this recipe! perfect for memorial day! it looks delish. A great easy recipe for a last minute cake! I love the gorgeous pink and rustic look. what a great recipe--minimal ingredients, maximum flavor! nice one, nic! This certainly looks deserving of World Baking Day. A lovely bake too - I am tempted to make this. 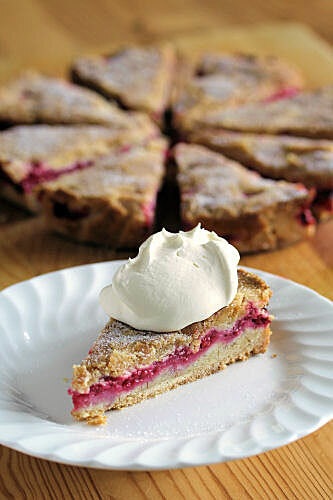 I don't think I've ever tried raspberry shortcake before but yours looks very good indeed. Any spare slices going? That looks so good I love your photos!